Japanese Tank was introduced in World of Tanks update version 8.10, and with the introduction of the Czechoslovakian tech tree, it is now the third newest tank nation in WoT. Currently, there is one end-tier medium tank line (two branches until tier 5 with mediums and light tanks) and heavy tank line. Althrough Japanese heavy tanks greatly differs from Japanese medium and light tanks, they all share few similarities. All Japanese tanks have great gun depression, (with exception being Chi-Nu Kai and some heavy tanks that have limited depression above their miniturrets), lack of sloping on armor (except on tier 8 - 10 medium tanks), and good firepower. Japanese medium and light tanks have few more things in common. They all have poor armor thicknesses, however, higher tier mediums (most notably the STB-1) have sloped armor, which may result in lucky bounces. They also combine good gun depression with guns that have excellent penetration and a good balance between alpha and ROF. In the first few tiers, the Japanese tanks can seem to prove to be a real turn off. Guns have generally good accuracy and handling (with expection being Type 61 and STB-1) Most Japanese medium and light tanks have decent camo values for their class. At tier II, the line splits between medium tanks and light tanks. Japanese light tanks offer good speed and agility, culminating into the Type 5 Ke-Ho, which is small, fast, agile, and packs a surprising punch. However, to balance these overall good characteristics, the three light tanks in the Japanese line lack in armor even more so than their medium counterparts, and are not exactly specialized for scouting in general. 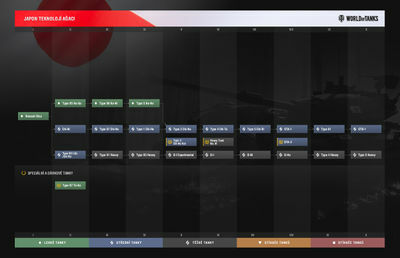 At tier V, the medium and light tanks lines reunite, and the Japanese tank line focuses solely on mediums which have decent accuracy as the line reaches later tanks, all of which have the capability to switch roles seamlessly when required. Past tier V, the medium tanks take rather wild variations between tiers. The tier 6 Chi-to is known for its overall good maneuverability for its size. The tier 7 Chi-Ri is notable for its very large size, rivaling the bulkiness of the German tanks found in the E50M line, being even bigger than some heavies of its tier, which makes it an enticing artillery target. Yet to trade for its large size, the Chi-Ri has the ability to equip a dangerous autoloader, the earliest medium tank in the game to do so. In addition, to compensate for these wild variations, all of the late-tier Japanese tanks feature above-average to good health pools, some rivaling those found along the E50M line as well. Other than few similarities mentioned earlier, Japanese heavy tanks are nearly polar opposities of medium tanks. They generally have terrible mobility (with exception being O-I Experimental), flat but extremely thick armor, huge alpha damage, takes a long time for reload. Japanese heavy tanks lacks real weakspots on front, but at cost they are much worse at angling than their German counterparts due to either terrible side armor or having weak cheeks on front that becomes easily penetratable when angled. They are also the biggest tanks in the game, being notably bigger than even the Maus, making them very easy targets from artillery. The tier 5, O-I Experimental, is like link between low tiers and higher tiers. It shares monstrous size and great firepower from its bigger brothers, however it still has rather weak armor like its predecessors. It also has something what other Japanese heavy tanks lack: mobility. From tier 6 and up, Japanese heavy tanks are generally quite similar: they have option of two guns (either 15cm howitzer or normal gun with high damage but poor accuracy), have very tough frontal armor with few weakspots, are gigantic, have poor mobility, generally poor side armor and high health pool. The infamous O-I is capable of oneshotting most same tier tanks and is unique due to having as thick rear armor as its front armor, but it has extremely long reload on its 15cm gun. O-Ni carries similar guns but has notably improved soft stats, health, acceleration and frontal armor, aswell as new 10cm with higher penetration and damage. O-ho is notable due to its very high rof on both guns, but has limited gun depression on front due to miniturrets. Type 4 Heavy differs from O-Ho with its worse mobility, hull cheeks being major weakspots but tougher side armor and completely new gun choices with notably higher alpha damage. The apex of Japanese heavies, Type 5 Heavy, has much tougher side armor and hull cheeks not being weakspots, meaning that it can finally sidescrape effectively, something that earlier Japanese heavies couldnt do very effectively. The Type 4 and 5 has two gun options; one of them, the 152mm gun, has highest potential alpha damage of all heavy tanks in the game with 1400 on its premium shells, capable of oneshotting many lower tier tanks! Diese Seite wurde zuletzt am 6. Juni 2017 um 22:26 Uhr geändert.